A positive growth cycle, however moderate, will delay the timing of the final leg in the secular bear market that started in 2000, we think. The first cyclical bull market within the ongoing secular bear market was 2003-07, the current second cyclical bull market started in March 2009 and should continue until the next earnings recession. 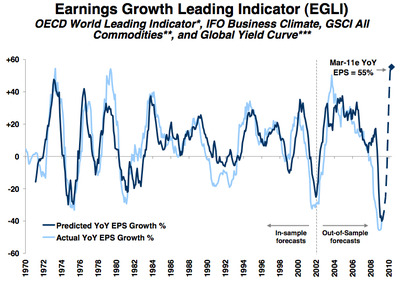 Our earnings growth leading indicator (EGLI) points to over 50% earnings growth in the next 12 months, and we expect earnings growth of 35% and 10% in 2010 and 2011 (versus IBES consensus expectations of 33% and 23%, respectively). Equity valuations are reasonable. We prefer equities over fixed income on a 12-18 month view. In fact, as shown by consensus earnings growth expectations mentioned above, most people are bullish on European profits this year. 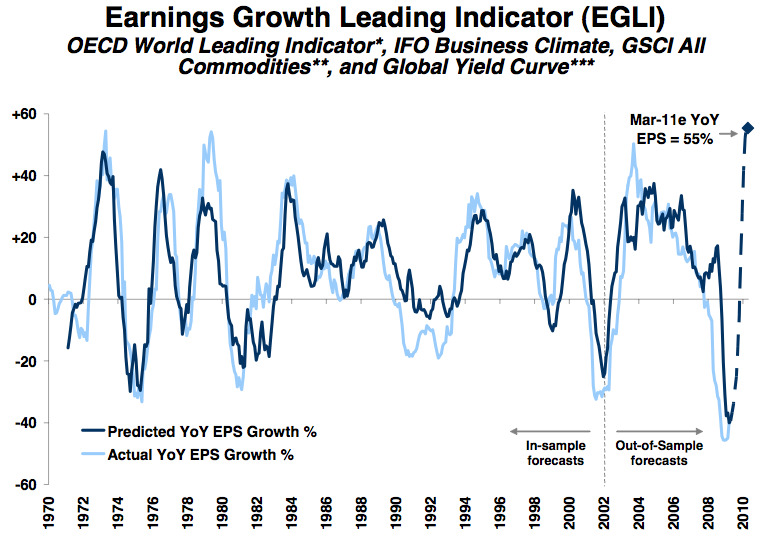 Morgan Stanley was even forced to tone themselves down, note they weren’t willing to commit their official forecast to the 55% EPS growth that their ‘Earnings Growth Leading Indicator’ model projected.